Know and Learn About Small Scale Agriculture Business. You cannot move a wrong way while starting a small scale agriculture business. If you are a new businessman, in this case, you should learn every ins and outs of the business within the time you have in your hand. You have to remember that it will not be possible for you to know and learn everything very aptly and minutely. You should remember that some learning will come through a job. Besides, you will not forget that trial and error is messy, time-consuming and sometimes costly. Yet it is mandatory for agriculture business. So take the process. But you have to make a balance. If you can go directly in touch of a mentor in your community who has vast knowledge in this business, it will be really helpful for running your business. If you do not have any mentor, you should work on a farm.as a volunteer. You will achieve experience before you start your dream. Designing and Planning your Small Scale Agriculture Business. Before launching your small scale agriculture business, you have to define the business that you are going to run. You have to take decision whether you would start a micro-scale vegetable farm or grow acres of hay for other farmers. Maybe you will think of a diversified farm – a small-scale operation that will grow a variety of animals and crops. You may even think of starting an ecotourism farm where the visitors will come to stay for see the workings of your farm and perhaps even participating in farm chores. A business plan is an integral part of running a business for taking up an entire step. It is the place in which you can transform your dreams and brainstorms into reality. You may be surprised if you require a business plan. The simple answer would be that a business plan is the prerequisite of starting a business. In case of writing a business plan, you will think of markets, supply and demand, as well as every ins and outs that is related to your farm operations, management structure, financial analysis, products and price points. You have to remember that designing and planning yare interrelated. You have to seek for Grants and Loan. You may not have total capital while starting farming business on a small scale that you’d like to do. You can run a small business like dipping a toe in the water and observe how you enjoy farming on a micro scale. But it will not be possible as it will take a long time to get anywhere using this method. Besides, it will not be possible for you to invest a significant amount that will bring product to market. You have to seek Grants and Loan which are provided for young and beginning farmers. Law may vary from country to country for establishing a small scale agriculture business. The basics are the same in everywhere. Perhaps, it will require to register your business name, purchase a business license, get an employer identification number, and carry product liability insurance. You have to take decision on your business structure whether it would be proprietorship, an LLC or something else. You have to contact with an accountant for getting information specifically to your situation. You have to consider of financial planning about your business plan. You should have to set up a system for bookkeeping and accounting from the very beginning of your small scale agriculture business. 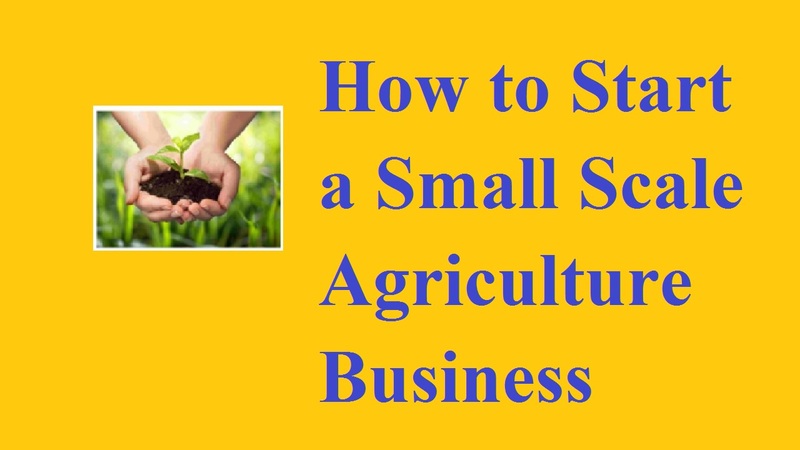 Under the light of above discussion, I can assure you if you follow these principles in starting a small scale agriculture business, you will surely be succeeded.